Sgt. Major Mike Kish, just back from his second deployment to Iraq, hasn’t come to terms with the war’s legacy. The justifications offered for the Iraq War have morphed and changed since American and coalition forces invaded in 2003. The one constant is that the war has kept going, year after year. Nearly 1 million American soldiers have served in Iraq, President Obama noted recently. Nearly 5,000 have died there. In late October, a grayer Obama than the one Americans elected stood at a White House podium. But for some veterans, the war continues. In New York City, Krzysztof Matejkowski, a former Fort Lewis-based Stryker Brigade soldier, became so incensed at the callous treatment given to a Marine veteran by riot police at Occupy Oakland that he donned his uniform top and marched on the New York Stock Exchange with 99 other vets a week ago. In Harrison, Idaho, former platoon leader Kevin Kincheloe was out for a run last week and was jarred back to Iraq by the smell of burning plastic in a neighbor’s burn barrel. Toxins from burn pits are an as-yet unknown health threat to soldiers who served in Iraq. In Boise, Sgt. Major Mike Kish is just back from his second deployment to Iraq with the Idaho National Guard’s 116th Brigade Combat Team. He still hasn’t come to terms with the war’s legacy. “You are entrusted with lives and making decisions, and if you’re not questioning every once in a while — ‘Is this working? What I’m doing, is this the right thing?’ … If you don’t lose some sleep once in awhile…” says Kish. These men have appeared previously in the pages of The Inlander, reflecting on their experiences as members of the small percentage of Americans who have gone to war. Each has been blown up, shot at, and has had comrades injured and killed. Matejkowski was blown out of a Stryker, the Army’s troop-carrying vehicle, through a topside hatch by the force of an enormous IED in Baghdad. He bounced off netting and fell back inside, unconscious, among the dead and wounded. In mid-deployment in 2006, Matejkowski’s 12-month tour was extended to 15. 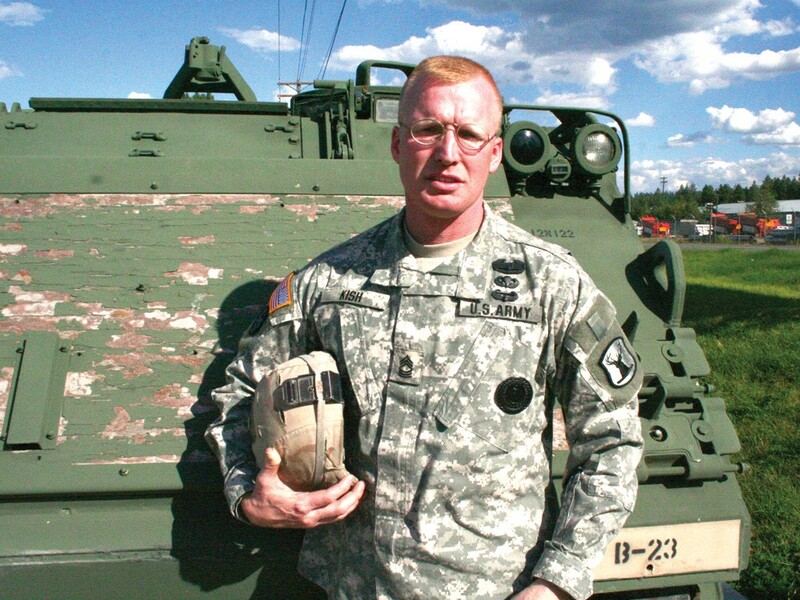 He was whipped around the country from hot spot to hot spot — Mosul, Baghdad, Baquba — and his unit suffered 14 dead, still the highest among Stryker units at Fort Lewis. But the unit’s efforts, as part of the surge, helped create enough security for Iraqis to vote in national elections, which seems to have established some foothold for civil society. So to come back and have a veteran, Scott Olsen, suffer a fractured skull after being hit by a police tear-gas canister during a protest in Oakland last month angered him, as it did “a lot of veterans,” he says. In the lakeside town of Harrison last week, the barrel filled with burning plastics took Kincheloe right back to Iraq. The pungent smoke from burn pits, where all manner of waste was doused with diesel and set alight, was a constant at FOB McHenry, a crude base in the northern tip of the Sunni Triangle. This is where Kincheloe was deployed in 2004 with a task force of Idaho, Montana and Oregon National Guard soldiers. It was an intense tour, with 900-plus IEDs exploded against task force soldiers, frequent firefights, and one of every 10 soldiers becoming casualties of war. Mike Kish, in the middle of his second deployment, was astonished to get a Facebook friend request from Mohamed, an interpreter he met in Iraq. Two things struck him as encouraging: the use of social media by ordinary Iraqis, and that Mohamed, a minority Turkoman with little future a decade ago, is now the elected mukhtar, a position similar to mayor, who represents a Kirkuk neighborhood of 1,600 people. But Iraq, despite anecdotal good news, is not settled, internal tensions are high, and the final accounting of soldiers’ sacrifices remains unwritten.